You have proved Wangari is right! In just 43 days, you changed the world by supporting a little sewing school in Eastern Congo that will change the trajectory of the lives of hundreds, perhaps thousands, of women. This evening, the Congo Restoration Sewing School in Bukavu took its first step toward reality. We raised $15,310 — enough for us to open our doors this summer. Now it’s time to find a space, hire teachers, buy sewing machines, and sign up new students! 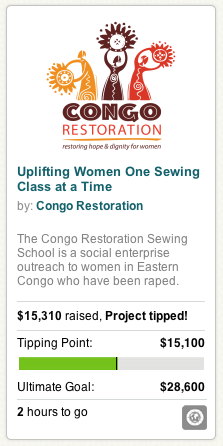 The board of directors for Congo Restoration and the women of Eastern Congo can’t thank you enough. Now, let’s get to opening that school! This entry was posted in Uncategorized on April 20, 2014 by Dawn McMullan.